Enjoy your time away knowing your pet is having fun with furry friends. Contact Camp Bow Wow Woodlawn today at (410) 885-6445 to learn more. Your dog is your family – at Camp Bow Wow Woodlawn, we understand that. As dog lovers ourselves, we take your pup’s care very seriously. That’s why we think of ourselves as so much more than just a dog boarding service. We are here to provide love and support for your furry family member while you are away—filling that gap as best we can until your return. 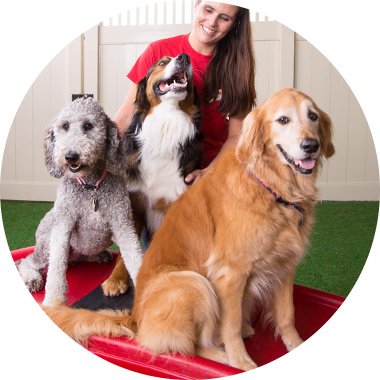 We’ll do everything we can to ensure your dog is happy and healthy during Overnight Camp and you can feel confident knowing your dog will be well-cared for during their stay in our safe and secure environment. Pass a (free) socialization interview and spend at least one more 1/2 day before an overnight stay. Day care included in all overnight stays. Family dogs must share Cabin for multi-dog pricing. Price is charged per night. Does your pup need a little extra pampering? Book our suite so that they can enjoy all of the comforts of home after romping all day at Camp! Our suites are spacious camp-themed retreats in a private setting with large raised beds, fuzzy blankets, and a flat screen TV for your Camper to watch as they settle into bed. And the best part... while your pup is snoozing the night away you can check in on them from their very own online Camper Cam. Price is charged per night. Applies only to dogs from the same household. Family dogs must share the same Glamping Cabin for multi-dog pricing. Price is charged per session. 15 minutes of one-on-one time with a Camp Counselor for extra belly rubs and head scratches. Specialized, personal attention for your pup, while you're away. You pick the service and the number of sessions per day, per stay and we take care of the rest.